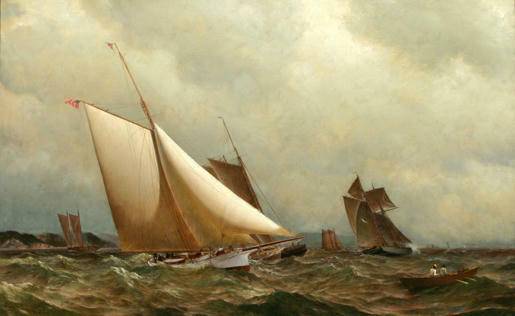 A proud yacht owner’s active narrative portrait of his new racing vessel, this oil painting was composed by A. Cary Smith for his friend, Commodore William A.W. Stewart of the Seawanhaka Yacht Club of New York. Stewart, a true Corinthian yachtsman and insurance lawyer of New York City, had just acquired the famous sailing cutter MAGGIE from George H. Warren of Southampton, who owned and raced her successfully in American waters since 1882. Prior, Stewart owned and raced the Schooners NETTIE, FANNY and the Sloop REGINA. MAGGIE here slices past a catboat schooner and several others. Naval architect, philosopher and marine painter A.S. Smith acquired his taste for the water at an early age. He grew up in New York, with the eastern shore of the Hudson river for a playground. Close by his home was the shipyard of the great William Webb and across the river in Hoboken was moored the fleet of the fledgling New York Yacht Club. In 1855 “Archie” Smith apprenticed himself to learn the art and mystery of yacht building. While still in his teens, he learned to draw and lay down lines, which became the foundation for his talent at marine painting. He then studied painting with M.F.H. de Haas. Smith soon became one of America’s foremost designers of large schooner yachts, but his passion and skill at marine painting was his greatest legacy. By the 1860's Smith’s paintings were being well received at exhibitions at the Pennsylvania Academy and the National Academy of Design. This led to illustrations for popular magazines and engravings. Although he designed great schooners until well into his seventies, his nature led him to prefer clients who sought him out for paintings rather than his famous yacht designs. It is believed Smith painted less than 200 works, making them quite rare commodities today.